This little guy is so stinkin' cute!! I knew as soon as I saw this card on Mary Fish's blog that we'd be making it at class - and, we did!! Thanks so much to Mary for her inspiration on this card!! We start our card with a Sahara Sand card base, then added a layer of Cherry Cobbler card stock, followed by a layer of Whisper White card stock. Next, we stamped "Let it Snow' and those adorable snowflakes (from the Snow Place Set) in Basic Black Archival Ink on the bottom of the card. 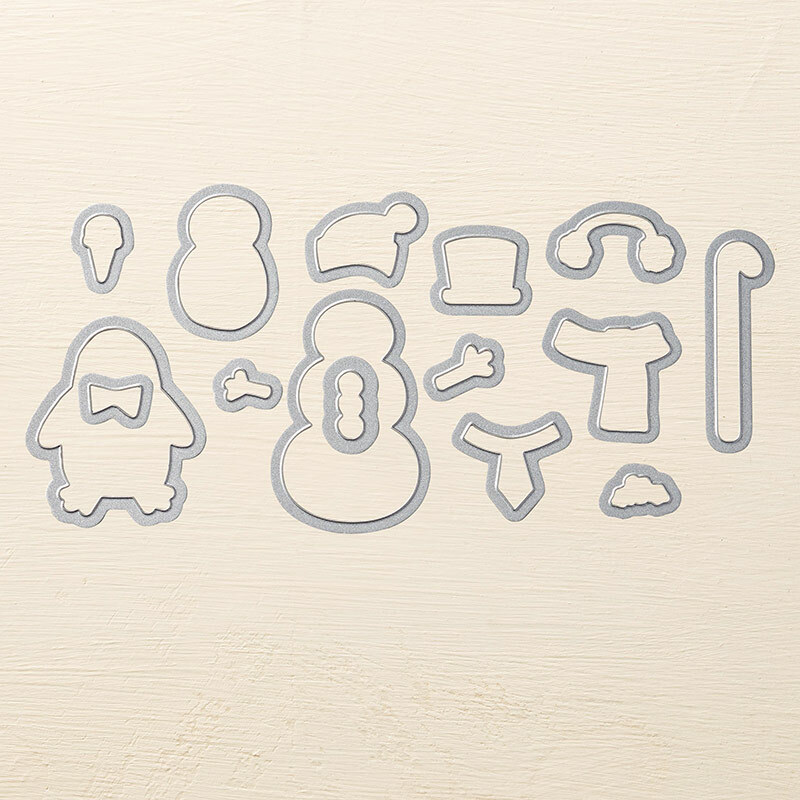 We even stamped a few snowflakes inside our card :). 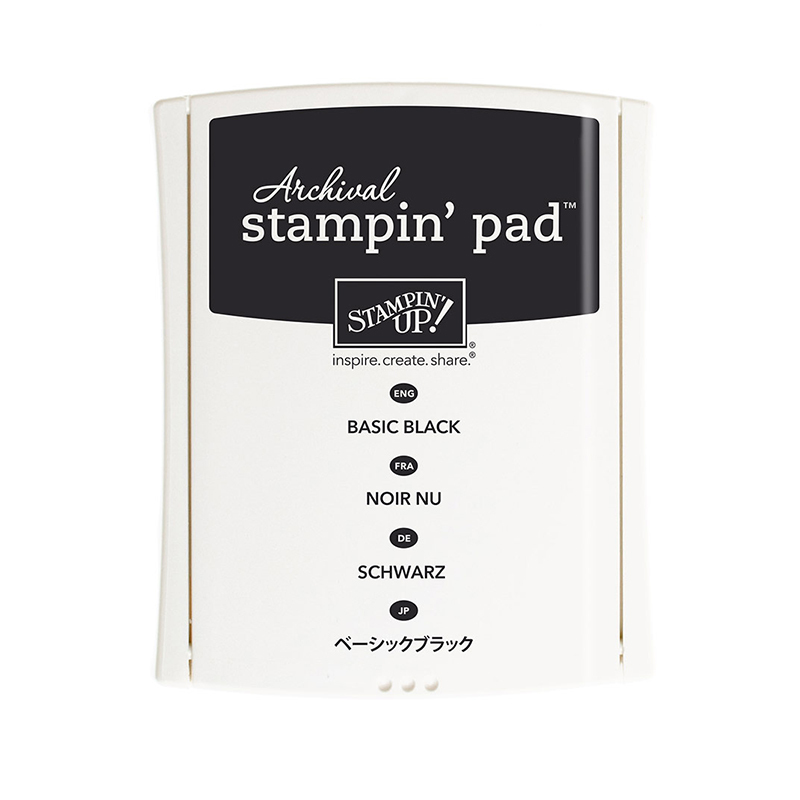 This is what Stampin' Up has to say about our new Basic Black ink pad: Make a lasting impression with our archival ink. Classic Archival Pads have permanent ink, making them the obvious choice for watercoloring techniques. The innovative ink pad design has a patented flip-top lid and a felt pad to give you a superior stamping experience. Archival ink works equally well with rubber stamps and photopolymer stamps. Next, we stamped our penguin (in Basic Black Archival Ink) and his scarf (in Cherry Cobbler ink) and die-cut these images with the coordinating Snow Friends Framelits. 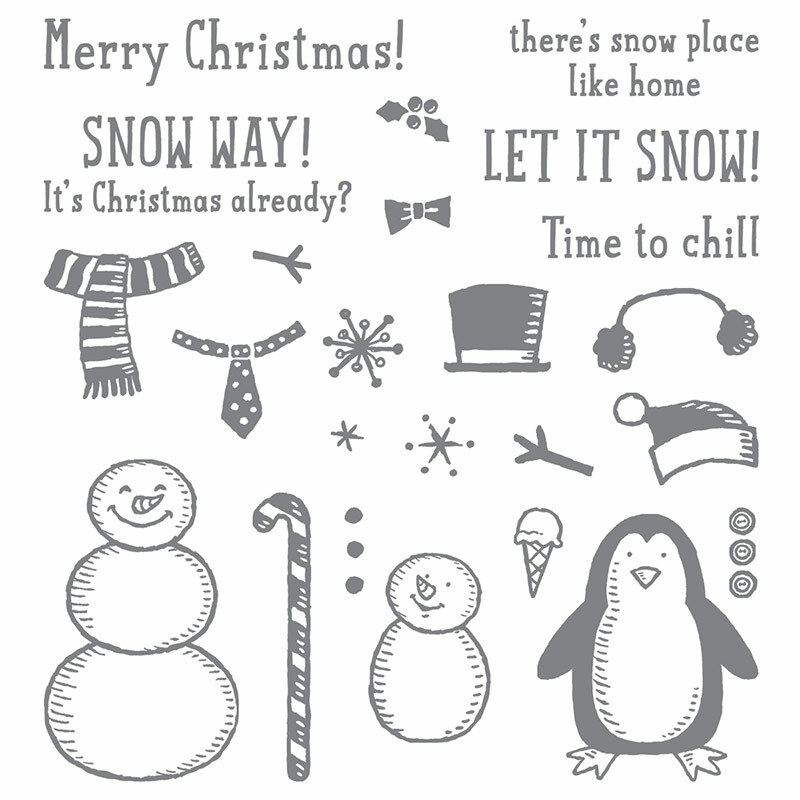 The Snow Place Stamp Set and Snow Friends Framelits are also bundled together for a 15% savings on both items. We also added a Rhinestone to the penguin's scarf for a little sparkle. 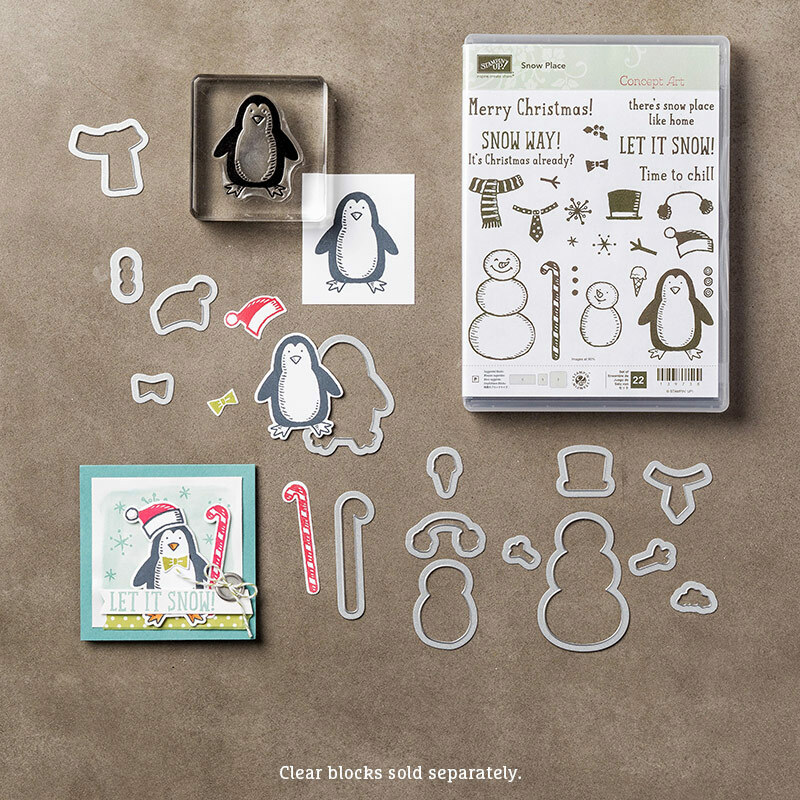 Our cute penguin is layered on top of a number of pieces of card stock (in Whisper White, Cherry Cobbler, Sahara Sand and Basic Black) to really highlight and feature him on this card. I hope you enjoyed this card as much as I did! If you'd like to make fun cards like this, too, consider attending the All-Occasion Class down at the Gathering Inkspiration Stamp Studio. This class meets the second Wednesday of every month anytime from 4-9pm and the following Friday from 1-3pm. We make 4 cards each month for a $15 fee, or the class is FREE with an order that night! and Friday, December 11 from 1-3pm. And... find something you liked today?? Order online anytime!! Just click the link below!! Let it snow---on Christmas Eve---that's it. Make Your Wish List Out Today! !